Pauline Réage Novel Award for Salvation: A Novel of the Civil War, 2015. Lambda Literary Award for Salvation: A Novel of the Civil War, 2015. Out in Print’s “Best of 2014” for Cub. Out in Print’s “Best 13 Reads for 2013” for A Romantic Mann. Saints and Sinners Literary Festival Hall of Fame, 2013. Out in Print’s “Best of 2012” for Purgatory: A Novel of the Civil War, 2012. A Novel of the Civil War, 2012. Pauline Réage Novel Award for Fog: A Novel of Desire and Reprisal, 2012. Jerome Niles Dean’s Faculty Research Award, 2011-12. Winner, Established Poets’ Contest, Metrorail Public Art Project, 2011. John Preston Short Fiction Award for “Kidnapping Chris,” 2009. 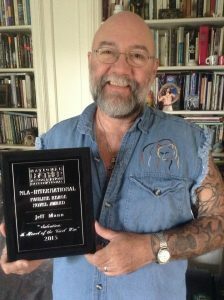 Lambda Literary Award for A History of Barbed Wire, 2007. College of Liberal Arts and Human Sciences Certificate of Teaching Excellence, 2007. Featured Author in Appalachian Heritage 34.3 (Summer 2006). West Virginians (DVD documentary), directed by Layne Amerikaner, 2005.
the West Virginia Book Festival, 2004. Winner, White Fish Press’s Key West Writing Contest in Poetry, 2001. First Place, Literal Latté Food Verse Awards, 2000. Winner, Gival Press Poetry Prize for Flint Shards from Sussex, 2000. Winner, Poetic Matrix Chapbook Series for Mountain Fireflies, 1999. Winner, Stonewall Chapbook Competition for Bliss, 1997. First Place, Yemassee Poetry Award, 1995. Against Hunger Contest, Roanoke, Virginia, 1995. Winner, James Paul Brawner Expository Writing Contest, West Virginia University, 1983. Phi Beta Kappa, West Virginia University, 1981. Gamma Sigma Delta, West Virginia University, 1981. Xi Sigma Pi, West Virginia University, 1981. Jon Scott Nelson Freshmen Creative Writing Contest, 1978.